** Special introductory price to celebrate our iPad release – over 1/2 off! Pocket Informant® is an integrated calendaring and GTD®-based tasks solution for the iPad. Our purpose is to fuse together best-of-class calendaring with best-of-class tasks into one great solution. ❖ Syncs with Google Calendar and Toodledo. ❖ Direct to Outlook Sync. Requires separate $5 WebIS Desktop Sync software. Visit our http://tinyurl.com/yggbk2a for more details. Pocket Informant for iPhone has been one of our most popular applications ever – which is saying something when you hit #4 in sales for all mobile apps for several years running! We’ve been lucky to see people all over the world love our app and rely on it every day so when Apple introduced the iPad we knew this a device built just for us. 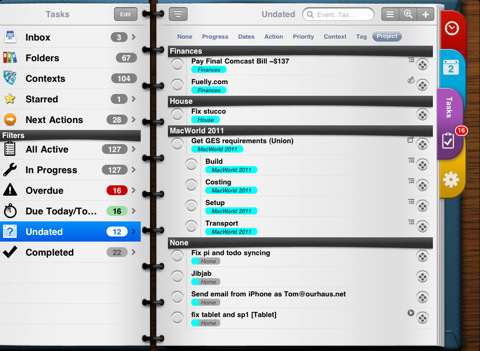 The iPad allows us to take the robust engine behind Pocket Informant and re-imagine it for a big screen. Its a lot more than just seeing more data on the screen – it has to be natural to work with and with the iPad version of Pocket Informant we are really proud of the final product. Why Do I Need This When I Have A Calendar? We love our iPads, but we saw some untapped potential for a full-featured PIM. Pocket Informant fills that gap. To start with, we made navigation very natural – simply swipe between the months, or tap the calendar on the left page. You can assign icons to individual events or tasks or use our original TimeBar style to see a visual description of your day, week, or month. When looking at a day’s activities, we show you your appointments AND tasks together, and we give you nearly the entire screen to see them. We offer a convenient view to quickly see activities going on “today”, and we built a great week view as well. Localizations: English, German, and French. New Languages will be added in future releases. GTD® and Getting Things Done® are registered trademarks of the David Allen Company. Pocket Informant and WebIS are not affiliated with or endorsed by the David Allen Company.